You do a search on Google to find someone to make a t-shirt quilt. My goodness, there are so many websites, so many styles, so many prices. How do you know who to select? What questions should you ask? How do you select a company to make YOUR custom t-shirt quilt from YOUR treasured t-shirts? Everything from the experience of the quilt-maker, the materials used, and customer service. Experience - How many t-shirt quilts has this company made? Group-On, Crafters, Mom and daughter teams. ASK how many quilts this company has made. 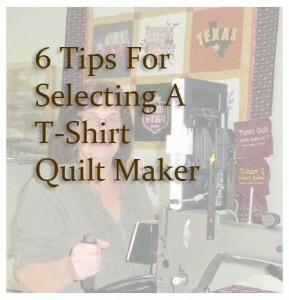 Over the past 14 years, T-Shirt Quilts of Texas has made several thousand quilts. Do you really want your quilt made by a beginner? Materials - What materials are used - Looking at several websites, you'll see such options as "brand new sheet" or "Fleece" backing. Look for 100% cotton quilt shop quality fabrics. The backing fabric should be the same type of fabric as the top of the quilt. That means 100% cotton. Stabilizer - Stabilizer is very important in making a quilt that will last a lifetime. Ask what type of stabilizer will be used. - Pellon- a Polyester man-made artificial 'stiff' fusible. There are different weights of polyester, but pretty much always stiff and rough to the touch. - NONE - as in NO stabilizer at all. - 100% Cotton - T-Shirt Quits of Texas is the only company offering this stabilizer in all quilts we create. It costs a little more, but the results in creating a quilt that will last a lifetime we feel is worth it. - Quilted - Professional machine quilting in an overall pattern and is pleasing to the eye. Some quilters use a 'scribbling' type of quilting, and usually results in a quilt that is not pleasing to the eye, but rather frenzied and chaotic. - Tied- This usually means the provider does not have the equipment or initiative to create a professionally finished quilt*. They create anywhere from 4 to umpteen 'ties' that is supposed to hold your quilt together, but in reality is a shortcut that leads to destruction once the quilt is laundered more than a few times. - Nothing - One of the more well known 'repats' company** does not use any batting, stabilizer or quilting. It's the cheapest product, but 'you get what you pay for". No batting, no quilting and a fleece backing. This is a blanket and not a quilt and best to avoid if you want this to last more than a few launderings. Quilt Finishing- Is the quilt professionally machine quilted? Is the quilt "tied". Some providers do a random 'scribble' stitch in each block. This is usually not pleasing to the eye. A PROFESSIONALLY machine quilted T-Shirt quilt will have a quilting design that covers the quilt in an even pattern and does not distract from the quilt itself. Binding - Binding is the final step in finishing your quilt. There are several methods, some are better than others if you want your quilt to last a little bit or a lifetime. Backing Folded Over to the Front – an inch or more of the backing material is folded over to the front of the quilt and sewn down. This is what in quilting technical terms is “quick and dirty”. This is a sure sign of someone trying to get by with the least amount of work. Traditional Binding – a separate strip of fabric is sewn over the edge of the quilt in a two-step procedure. This is what you want to see! Too Cool T-shirt Quilts uses the two-step binding method with a machine sewn second seam. The photograph to the right shows a traditional binding being sewn onto a T-shirt quilt. Is the backing wrapped around to the front and stitched down? A quality quilt will have what is called a double fold binding. With t-shirt quilts, machine applied binding is the preferred method as it creates a finish that will last a lifetime. Some providers do not even do this traditional step. They sew what is referred to in the quilting world as the 'pillowcase' method. This is the cheapest way to finish a blanket. This means that the provider literally does a quick stitch around the edges, turns it inside out and calls it 'good'. The binding on a quilt is used to finish the three raw layers of a quilt. There are 3 basic types of bindings, of which the first 2 should be avoided. * Quilt - 3 layers consisting of a top, batting and backing. ** Project Repat - Cheapest BLANKET producer, but product does not stand up to more than a few launderings. Does not include batting or stabilizer.